From January 25, 2019, guests can purchase the Shanghai Disneyland Annual Pass through the Shanghai Disney Resort official WeChat account, the Shanghai Disney Resort official WeChat Mini Program “E-gift Ticket”, the Shanghai Disneyland Main Entrance ticket booths, and the Shanghai Disney Resort Reservation Center at 400-180-0000 or +86-21-3158-0000. The Annual Pass can be redeemed and used to enter the park from January 25, 2019. From February 15, 2019, guests can purchase the Shanghai Disneyland Annual Pass via the Shanghai Disney Resort Official Website and app. The Annual Pass can be redeemed and used to enter the park from February 15, 2019. Annual Pass Holder must redeem their Annual Pass at the Shanghai Disneyland Main Entrance ticket booths during park hours every day. Your original ID credential (Government ID/Passport/Travel Document) associated with your Shanghai Disneyland Annual Pass (standard, child, senior and disabled) will be requested when you are using it to go through turnstiles. Annual Pass Holders who cannot provide valid original ID credential which matches the information printed on the Annual Pass will not be allowed to enter into Shanghai Disneyland. The Shanghai Disneyland Annual Pass is valid for 365 days (“valid period”) starting 15 days after the date of purchase. The pass validity period will not be impacted by the date of the pass’s redemption or the date of the guest’s first entry to the park using their new Annual Pass. Shanghai Disneyland Annual Pass Holders can visit Shanghai Disneyland from the date of purchase once they have redeemed their Annual Pass successfully, but are still subject to the Annual Pass calendar. i. 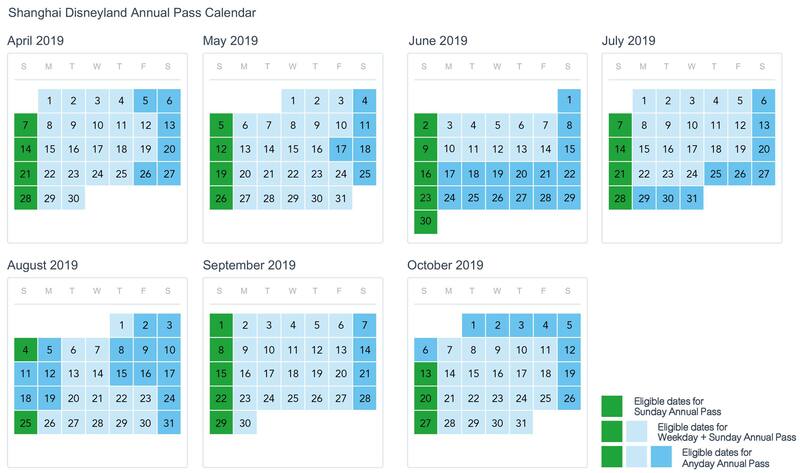 If you purchase an Anyday Annual Pass on January 25, 2019, the pass validity period runs through February 8, 2020. However, you will still be able to redeem the Annual Pass at Shanghai Disneyland Main Entrance ticket booths and enjoy access to the park from January 25, 2019.
ii. If you purchase a Sunday Annual Pass on Friday, February 8, 2019, the pass validity period runs through February 22, 2020. However, you will still be able to redeem the Annual Pass at Shanghai Disneyland Main Entrance ticket booths from February 8, 2019 and gain access to the park on both Sunday, February 10, 2019 and Sunday, February 17, 2019. Guests are advised to redeem their Annual Pass at the Shanghai Disneyland Main Entrance ticket booths within 15 days of the date of purchase. Any Annual Passes not redeemed during this time will be automatically activated. Enjoy up to 20% off your room rate when you stay at a Shanghai Disney Resort Hotel! Shanghai Disneyland Annual Pass Holders can enjoy approximately 20% off meals at Table Service Restaurants and Quick Service Restaurants in the park and at the two resort hotels during the Annual Pass validity period. This discount is valid during the Annual Pass validity period. This approximately 20% off coupon cannot be used in conjunction with any other benefits. You must activate your Annual Pass by registering in the Benefit Center section of the Shanghai Disney Resort official WeChat account. Only then will you receive your approximately 20% off food and beverage coupons. Each Annual Pass Holder will receive a maximum of five (5) approximately 20% off food and beverage coupons per week. You will be asked to present your approximately 20% off food and beverage coupon and physical Annual Pass to receive this discount at the point of purchase. A valid ID (government ID, passport, or travel document) may be requested when using your Annual Pass in order to verify the Pass Holder’s identity and to ensure the pass’s use remains strictly personal. Discounts do not apply to the purchase of birthday cakes, alcohol, specialty beverages, service charges or any other promotion or dining package and cannot be combined with other products/services. (such as the package including Nighttime Spectacular reserved viewing areas). The above benefits are only valid for Annual Pass Holders. You will be ineligible to benefit from Annual Pass advantages if you do not follow the terms and conditions as outlined. The approximately 20% off coupon is valid at all Table Service Restaurants and all Quick Service Restaurants in the park and hotels. Shanghai Disneyland Annual Pass Holders can enjoy approximately 20% off merchandise at all Disney shops at Shanghai Disney Resort during the Annual Pass validity period. This discount is only valid during the Annual Pass validity period. The approximately 20% off coupon cannot be used in conjunction with any other benefits. You must activate your Annual Pass by registering in the Benefit Center section of the Shanghai Disney Resort official WeChat account. Only then will you receive your approximately 20% off merchandise coupons. Each Annual Pass Holder will receive a maximum of five (5) approximately 20% off merchandise coupons per week. You will be asked to present your approximately 20% off merchandise coupons and physical Annual Pass to receive this discount at a point of purchase. A valid ID (government ID, passport, or travel document) may be requested when using your Annual Pass in order to verify the Pass Holder’s identity and ensure the pass’s use remains strictly personal. Shanghai Disneyland Anyday Annual Pass Holders can enjoy up to 12 Early Park entries subject to the resort’s Early Park Entry availability. This benefit is only valid during the Anyday Annual Pass validity period. A valid ID (government ID, passport, or travel document) may be requested when using your Anyday Annual Pass in order to verify the Pass Holder’s identity and ensure the pass’s use remains strictly personal. This benefit can only be used during the resort’s Early Park Entry available days. The Park Early Entry available calendar can be found on the reservation page of the Park Early Entry section of the Shanghai Disney Resort official WeChat account. You must redeem your Anyday Annual Pass by registering in the Benefit Center section of the Shanghai Disney Resort official WeChat account. Only then will you receive your park early entry coupon. Each Anyday Annual Pass Holder will receive one park early entry coupon. The early park entry coupon can be used to reserve up to 12 early park entries during the Annual Pass’s validity period. Advanced booking of the Early Park Entry is required. The availability is subject to inventory and early park access cannot be guaranteed without a booking. There is a one reservation per day limit for early park entry coupons, and cannot change date after successful reservation. Guests must present a valid Annual Pass as well as a valid Government-issued ID or Travel Documents at the Main Entrance turnstiles in order to enter the park. Annual passholders who reserve an Early Park Entry benefit are advised to arrive at least one hour before the published park opening time in order to fully enjoy the privileges of the Early Park Entry Pass. Early Park Entry Pass Guests who arrive after the published park opening time will be seen to have waived their Early Park Entry benefit privileges. Unused reservation will also be deducted from your 12 annual Early Park Entry benefits. Early park entry benefits should be reserved before your visit. Annual Pass Holders can visit the Benefit Center of Shanghai Disney Resort official WeChat account, and reserve their benefit through the “Early Park Entry Coupon”. When you arrive at Shanghai Disney Resort, please redeem your Early Park Entry Pass at the designated queue at Main Entrance Plaza. Present a Cast Member with your Early Park Entry Pass QR code located within the Shanghai Disney Resort WeChat Official Account. Print screens or pictures showing the Early Park Entry Pass QR code are not accepted. All guests booked to enjoy Early Park Entry benefits must be present together at the meeting location to redeem the Early Park Entry benefit if the booking is made by one WeChat account. Please call the Shanghai Disney Resort Reservation Center at 400-180-0000 for more information. Shanghai Disneyland Annual Pass holders can enjoy up to 20% off their stay at Shanghai Disneyland Hotel or Toy Story Hotel from Feb 9, 2019 to March 31, 2019. This discount of up to 20% off hotel room rates is valid from Feb 9, 2019 to March 31, 2019. 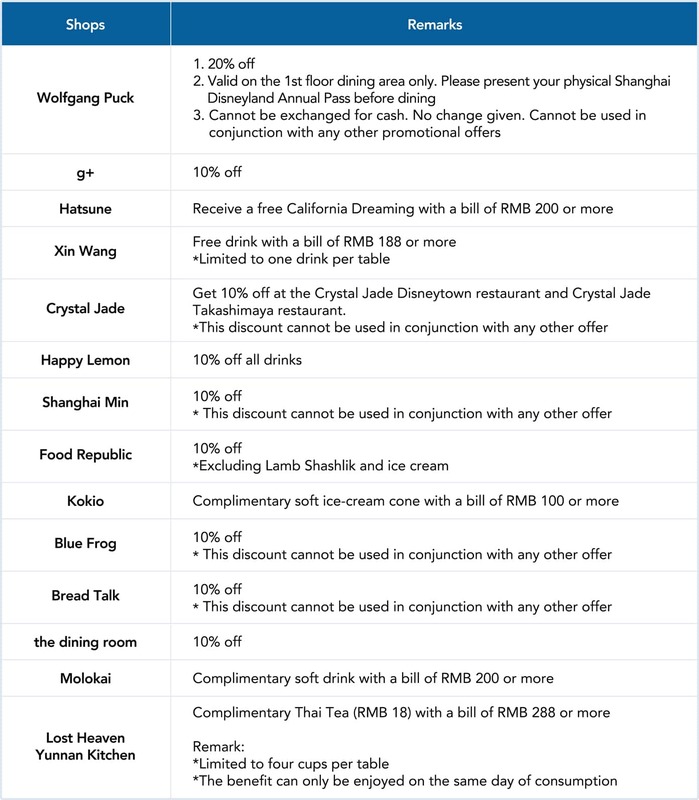 Please call 400-180-0000 or +86-21-3158-0000 for more detailed discount information when making your reservation. You must activate your Shanghai Disneyland Annual Pass by registering in the Benefit Center section of the Shanghai Disney Resort official WeChat account. You will be asked to present your physical Shanghai Disneyland Annual Pass at check-in. Maximum two rooms per booking - excluding suites. Shanghai Disneyland Annual Pass holders must be among the party registered to stay at the hotel. Discounted rooms are subject to availability every day. To make a reservation, please call 400-180-0000 or +86-21-3158 0000. 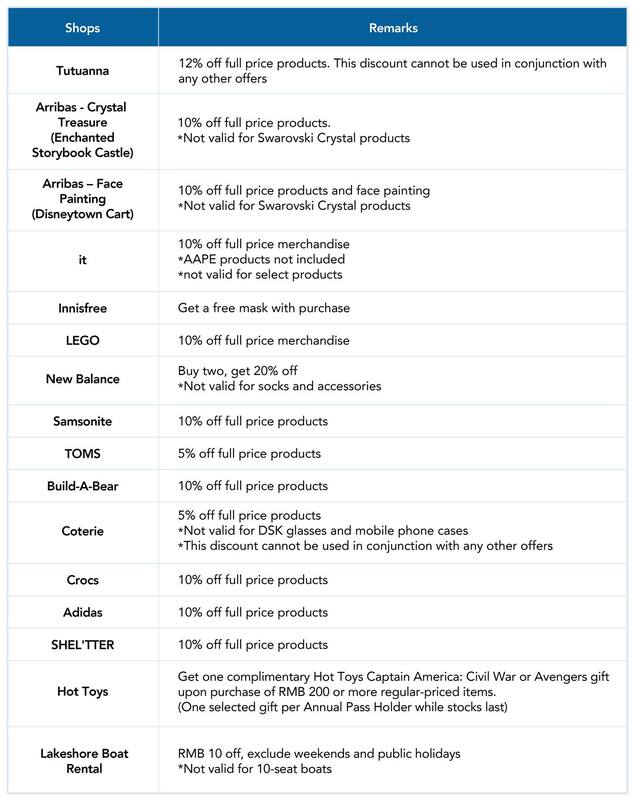 The above benefits are only valid for Shanghai Disneyland Annual Pass holders. You will be ineligible to benefit from Shanghai Disneyland Annual Pass advantages if you do not follow the terms and conditions as outlined. You will be asked to present your physical Annual Pass at the time of purchase. The following benefits are only valid for Annual Pass Holders. You will be ineligible to benefit from Annual Pass advantages if you do not follow the terms and conditions as outlined. This upgrade is only available for Guests who have purchased their ticket. We will verify the guest’s identity at the ticket booths when they redeem their Annual Pass to ensure the upgrade is strictly for their use only. What is the price of theme park admission? Starting June 6, 2018, Shanghai Disneyland pricing will be set at three tiers – Regular, Peak and Peak Holiday. Regular price of admission is set at 399 RMB. Peak price of admission for high-demand dates, which include summer holidays, weekends, and many of the designated holidays, is set at 575 RMB. 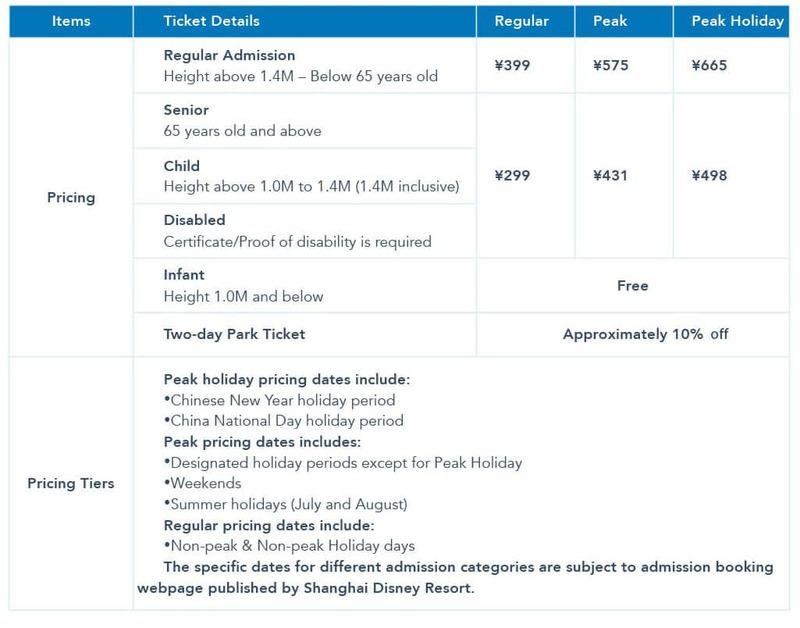 Peak Holiday price of admission for super peak holiday periods, which mainly include the Chinese New Year holiday and China National Day holiday periods, is set at 665 RMB. Special pricing (discounts of approximately 25%) will be provided to many of our guests, including children, seniors and our guests with disabilities. Infants receive free admission. A two-day ticket will be available at an approximately 10% discount. Tickets will be date-specific and valid for admission only for the date purchased. Guests with valid admission will be guaranteed entry into Shanghai Disneyland for the date purchased. A ticket to the park will provide a full day of world-class family entertainment and immersive storytelling experiences. 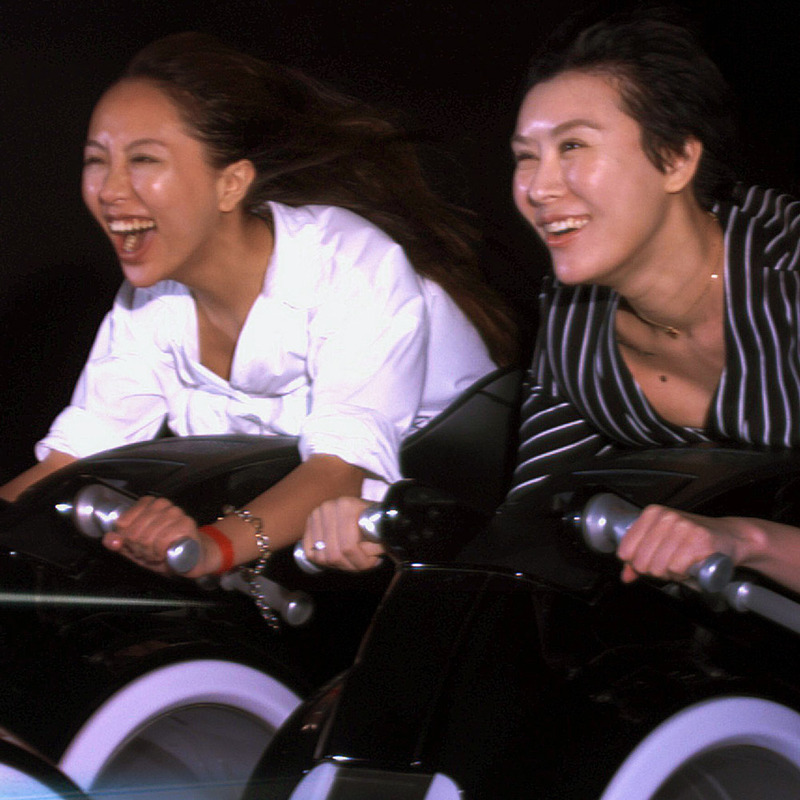 One ticket provides admission and access to all of Shanghai Disneyland’s attractions and entertainment inside the theme park. The BEAUTY AND THE BEAST musical, coming soon to the Walt Disney Grand Theatre in Disneytown, is a separately ticketed event. Where can guests purchase dated tickets? 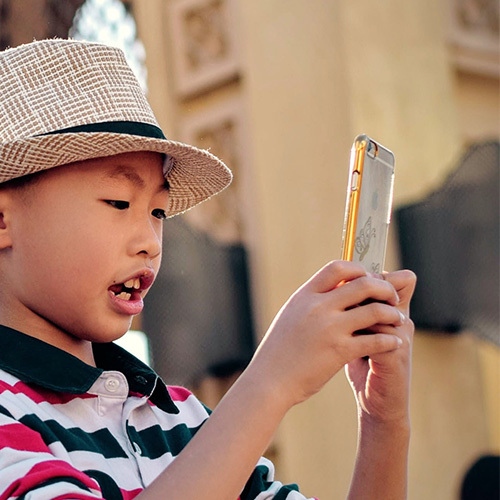 Shanghai Disney Resort APP, Download APP Now! Our official travel partners. A listing of official travel partners can be found here. What are the limits on quantity for purchasing Shanghai Disneyland tickets? There is a maximum of 5 tickets available for purchase. Can guests change the admission date on their ticket once purchased? Yes, subject to availability. Dated tickets can be replaced twice with new dated tickets of equal or greater value by paying the difference in admission fee and eligibility to replace is based on availability; date changes must occur 2 days before the entitlement date. Guests who purchase tickets from a third-party reseller must complete exchanges or modifications from the same reseller. Guests can visit our website or call the Disney Reservation Center for more information. How can guests book stays in your resort hotels? Resort hotel rooms can be booked through all authorized official channels. Do guests need an admission ticket to visit Wishing Star Park or Disneytown? No admission tickets are required for guests to visit Wishing Star Park or Disneytown. Will there be complimentary tickets to Shanghai Disneyland? 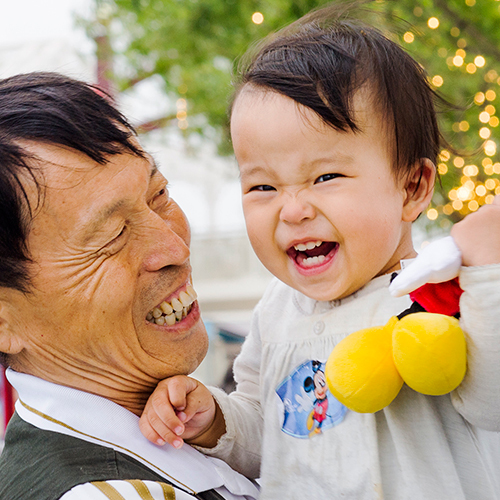 Infants 1.0M and below, accompanied by a responsible adult with a paid admission ticket, receive free admission to Shanghai Disneyland. There are no other complimentary ticket categories, and all other guests are encouraged to purchase tickets in advance using one of our official channels. This is one way we are managing the extraordinary demand we anticipate for our park in order to deliver a world-class experience for our guests. Our ticketing options spread out visitation throughout the year, putting choices in the hands of the guests. To avoid days with high demand, guests may want to consider visiting during our regular priced periods. Will there be a maximum number of guests allowed in the park at one time? Yes. Just as we do at all of our destinations around the world, we take great care to ensure a magical guest experience in our parks each day. Do you anticipate any changes to your pricing or ticket structure in the near future? We will continue to evaluate our various ticket options and may in the future make adjustments. We will also continue to think about ways to manage the extraordinary demand for our attractions and entertainment at Shanghai Disney Resort in order to deliver a world-class experience for our guests. What is the Shanghai Disney Resort Reservation Center? The Shanghai Disney Resort Reservation Center is a platform for guest reservation and resort experience inquiries. Guests can contact the reservation center at 400-180-0000 or 86-21-31580000 to purchase theme park tickets or make resort hotel reservations. How can guests purchase children, senior and disabled tickets? 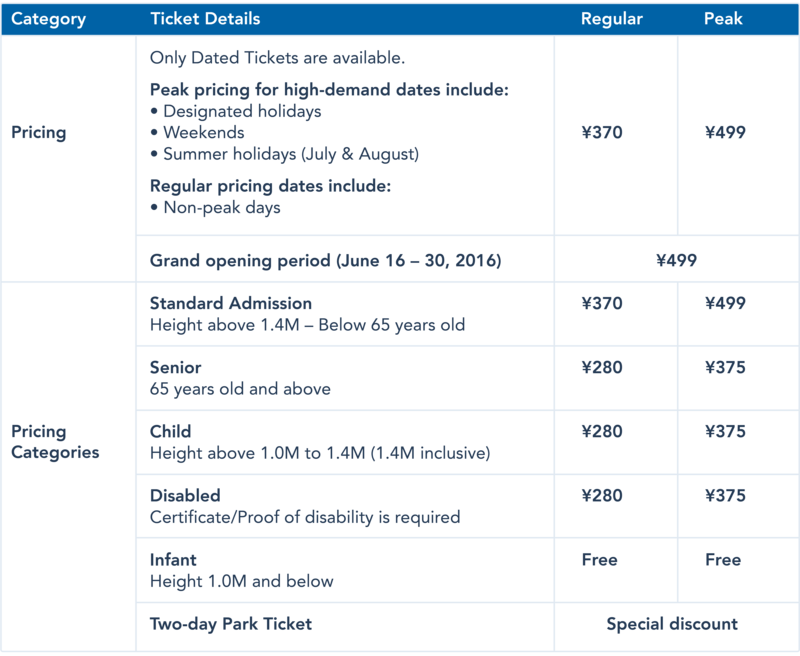 You may purchase senior and children tickets through all official channels. If guests want to purchase a disabled ticket, please contact the Shanghai Disney Resort Reservation Center by calling 400-180-0000 or +86-21-3158-0000 and our specialist will assist you with the purchase.